What are the possible places of duty for those who are going to join the Navy? First of all, these can be the surface ships. Each of the four Russian Fleets has them – the Pacific, the Northern, the Baltic, and the Black Sea Fleets, as well the Caspian Flotilla. Surface forces are the main forces to ensure safe sortie and deployment of submarines into combat areas and their return to base, and transportation and cover for the amphibious assault forces. They are assigned the principle role in mine laying, dealing with mine threats, and protection of communications. Each Fleet has its flagships. Thus, the Northern Fleet has our country’s largest ship, the heavy aircraft carrier Admiral Sovetskogo Soyuza Kuznetsov (Admiral of the Soviet Fleet Kuznetsov). The Black Sea Fleet has the Guards missile cruiser Moskva. Among the best ones of the Baltic Fleet are the destroyers Bespokoiny and Nastoichivy. The Guards missile cruiser Varyag and the major antisubmarine ship Admiral Trubits belong to the Pacific Fleet. The Caspian Flotilla has the missile ship Tatarstan and the small gunship Astrakhan. The ships of the Russian Navy pay regular visits and make business port calls into the foreign nations’ ports. Thus, just recently, our combat units visited the ports of France, Italy, Tunisia, and Portugal. Reinforcements are also awaited on submarines. 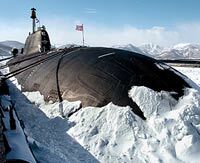 Submarine forces are the strike force of the Navy, able to covertly and quickly deploy in required directions and strike sudden powerful blows from the depth of the ocean at the waterborne and continental targets. Nuclear submarines, armed with ballistic and cruising nuclear charge missiles (the Naval Strategic Nuclear Forces) make up their basis. These ships are always present in the various regions of the World Ocean, ready to immediately employ their strategic weapon. Each of our Fleets also contains units of naval aviation, which consists of strategic, tactical, carrier, and coastal aviation. The strategic and tactical aviation is intended for fighting groups of surface ships in the ocean, submarines, and transports, as well as for bombing of and missile strikes at the coastal objects of the enemy. Carrier aviation makes up the main strike force of the air forces of the Navy. Naval aviation helicopters are an effective means of target designation for the ship’s missile weapons when destroying submarines and rebuffing attacks of low-flying aircraft and anti-ship missiles of the enemy. Carrying air-to-surface class missiles and other weapons, they are a powerful means of fire support for the amphibious assault forces of the marines and for destruction of missile and gun boats of the enemy. Naval coastal forces exist in every Fleet - the Northern, the Baltic, the Black Sea, and the Pacific. Besides the Coastal Missile and Artillery troops and the marines, they also include one coastal defense division each. Coastal defense forces, as a type of naval force, are intended for defense of naval bases, ports, important coastal areas, islands, straits, and bottlenecks from attacks of enemy ships and the marine assault forces. Coastal missile systems and artillery, antiaircraft missile systems, mine and torpedo weapons, as well as special coastal defense ships (the defense of waterway area) make up the basis of their armament. To provide defense, troops build coastal fortifications on shores. The marines are intended for military operations as part of the amphibious assault forces (individually or jointly with the ground forces), as well as for defending the coastline (naval bases, ports). According to the assessment by the Chief Command of the Navy, the military command bodies of the naval units are able to solve any problem they are presented with today. In dealing with questions of military training, main effort is directed towards maintaining the established combat readiness of the ships and units. Analytical research shows that more than 90% of officers and sub-officers are confident in their ability to fulfill their combat missions. The percent of drafted servicemen also approaches this level. Today, a lot of help for the man-of-war’s men, including the help for young sailors for adapting to service, is provided by patrons. Practically every ship and coastal unit has them. The following are just two examples. Just recently, the Baltic Fleet Command conveyed its gratitude to the leadership of Mordovia for the quality of training of the draftees. It should be noted that Mordovia oversees several ships of the Baltic Fleet. The Republic helps financially to provide a more comfortable life for sailors and conducts selections of the best draftees for naval service. A research and manufacturing association (NPO) Promavtomatika of the city of Krasnodar acts as a patron to the small missile ship Rassvet of the Northern Fleet. This friendship is already over seven years old. The association representatives often visit the Northern Fleet sailors and provide whatever help they can to support their combat spirit and improve service conditions. Recently, the sponsored ship was visited by the managing director of the NPO Promavtomatika, Grigory Tkachenko, and the assistant general director of an association for military patriotic education, Mikhail Sviridov. During the stay in the polar region, a meeting between the delegation and the Northern Fleet leadership took place. Already at the end of the 60’s of the twentieth century, a US Navy’s Captain of the 1st Rank, Harry Allendorfer, noted in one of the American magazines: “Almost every time you go into a [foreign] harbor, if there are no flag markings [on the ships stationed there] and you pick out the cleanest and best-looking ships, nine out of ten of them will be Russian.” One can say that this statement still keeps its validity and relevance today, in the 21st century. Russia is the largest sea power, the only country in the world that has simultaneous access to the three oceans of our planet. That’s why the attitude towards the Navy in our country has at all times been special. Sailors have always enjoyed high esteem, respect, and love. The attitude towards those who wear the uniform remains the same to this day, and it will always be the same. Almost all of the large port cities of Russia, as well as Sevastopol, have military units, and serve as bases for ships, on which man-of-war’s men of our country serve. Young sailors are awaited in the Pacific, the Northern, the Baltic, and the Black Sea Fleets, and in the Caspian Flotilla. Some of them will serve on the largest Russian ship, the Admiral Flota Sovetskogo Soyuza Kuznetsov, while others - on other combat units, ranging from major antisubmarine ships and destroyers to motor boats. Reinforcements are also expected in coastal units and marine units. Serving in the Navy is interesting. Our ships regularly pay official visits and make business port calls into foreign nations' ports. This means that all crew members, from officers to sailors, have an opportunity to acquaint themselves with foreign cultures, broaden their knowledge, and see the world. The service teaches not only discipline, but also order. Probably nowhere else is there so much care for the cleanliness of rooms, corridors, ladders, as there is on the ships of the Russian Navy. Cleaning, in the combat units, is done several times a day. The service is also difficult. During campaigns, sailors have to keep watch, and on shore they keep duty and stand guard. But it’s precisely this kind of service, the naval service that transforms yesterday's young, beardless lads into real men. Here they can also acquire professions that will be very useful to them in their civil lives. Service in the Navy remains in the memory of everyone who had the occasion to be a man-of-war’s man, and the sailor’s caps, as reminders of the naval service, are kept for decades.